Ranging in age from 13 months to 11 years our kennel of Polar Huskies spans wide from veterans with pawprints on the North Pole to impulsive yearlings for which the Arctic Blast 2001 expedition will be their first encounter with the Arctic and long expeditioning. But we are specialized forces. 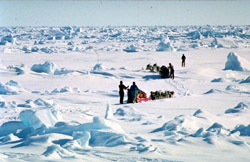 Over the last 20 years, me and my relatives (parents, grandparents and great grand parents) have been crossing the Arctic and Antarctic for tens of thousands miles on training trips and expeditions. 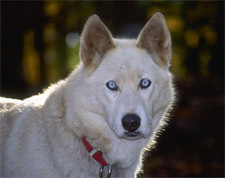 Originally, Will Steger "started" breeding us for his polar travels which is why we are called Polar Huskies. We are bigger, broader and heavier (weighing an average of 90 lbs.) than our sled-racing cousins. Bred for greater endurance and tolerance of cold weather, we are strong, very friendly and extremely loyal. Each of us different!